Not all potatoes are the same. Their roles in the kitchen are different. Although most people associate the potato with Ireland and Idaho, its evolutionary birthplace is Peru, a country that, to this day, has far more varieties of the vegetable than anywhere else. Having read about this diversity, I traveled to an annual food festival in Lima known as Mistura, where I encountered tables heaping with all manner of bizarre and beautiful potatoes: spuds that were shaped like croissants and cucumbers; that were knobbed, ruffled, and bowed; whose skin and flesh were as yellow as egg yolk, as black as ink, or splotched and striped with shades of red, blue and violet. The next day, back at the apartment where I was staying, I lifted the lid off a pot of boiling potatoes. Pungent ribbons of steam curled their way into my nose: the smell of newly dried cornstalks and wet earth mingled with something much sweeter, like that first bite of perfectly ripe peach. A tan one decorated with swirls of cherry tasted distinctly of roasted chestnuts. Another, with deep purple skin and white flesh marbled pink, had the flavor of caramelized beets. One daffodil yellow potato was unbelievably buttery. Many were more dense and filling than I expected. Savoring this meal, I thought about how utterly different it was from all my experiences with potatoes in the U.S. 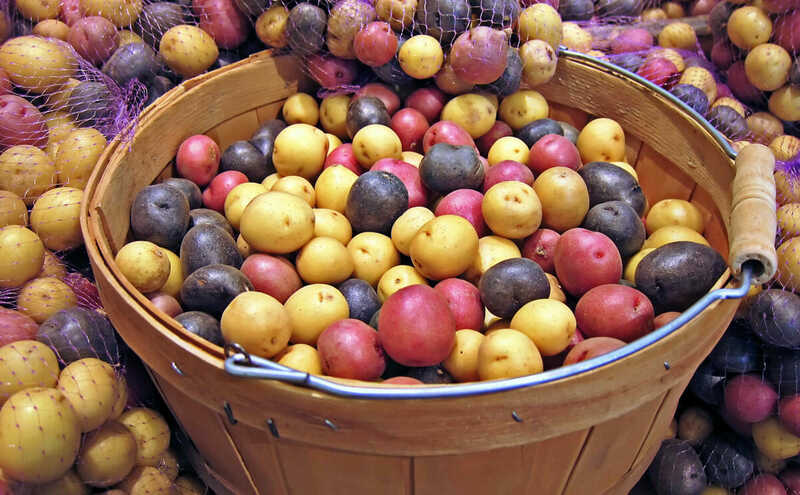 Although farmers markets sometimes offer fingerlings and purple potatoes, there are only two specific varieties familiar to the average American: the Russet Burbank, which makes up the vast majority of potatoes grown in the U.S., and the Yukon Gold. The other potatoes commonly seen in supermarkets are almost never called by their proper names; we simply refer to them as small or round reds and whites. Americans likewise dismiss the highly varied textures and innate flavors of potatoes. Instead, we prefer to smother them in lab-concocted powders. In the chip world, longtime favorites such as sea salt and vinegar have recently started to share shelf space with cappuccino, chicken and waffle, cheesy garlic bread and General Tso’s. It’s easy to laugh off these processed peculiarities, but America’s addiction to fries and chips, our pitifully limited selection of potatoes in the supermarket – our whole attitude towards the potato – are symptoms of something more insidious. Together, the rise of fast food chains and the pressures of industrial agriculture have enforced a bleak homogeneity on much of modern produce. By prioritizing comfort, cheapness and convenience above all else, we have sacrificed a lot of our food’s flavor, diversity and inherent nutritional value, not to mention the toll it’s taken on the pleasure of eating. Among all vegetables, the potato has likely suffered the most. By prioritizing comfort, cheapness and convenience above all else, we have sacrificed a lot of our food’s flavor, diversity and inherent nutritional value. Jansky and likeminded potato enthusiasts envision a revitalized American potato market that is much closer to Peru’s cornucopia. Several potatoes they have created through breeding or resurrected from seed banks are already available at some farmers markets, restaurants, and grocery stores, and several more should make their debuts soon. The relationship between potatoes and their human cultivators is long and tumultuous. The Inca’s ancestors first domesticated the wild potato between 7,000 and 10,000 years ago on the border of Peru and Bolivia. By 4,000 years ago, the potato had become a staple crop for native Andeans. The tuber was so integral to their culture that some groups based units of time on how long it took to cook various types. Around 1562, the potato traveled with European explorers from South America to the Canary Islands and subsequently to Spain. From there, it hitched a ride with herbalists and farmers to Italy, England and the Low Countries. Europe’s acceptance of the potato as something fit to eat was staggered and piecemeal. Botanists, intrigued by the unfamiliar vegetable, began gossiping. Their rumors turned into widespread myths that the potato caused wind and leprosy. People came to regard potatoes as poisonous, difficult to digest, and suitable only for pigs. One European country was the great exception, however: Ireland, where peasants were struggling to find anything that would grow in the only soil the English had left them. Then came along French army pharmacist Antoine-Augustin Parmentier, the Johnny Appleseed of the potato, as historian Charles C. Mann put it. During the Seven Years War, the Prussians repeatedly imprisoned Parmentier, feeding him little but potatoes. Yet, to his astonishment, he rather enjoyed his meals and remained in good health. After the war ended, amid revolts in France over the increasing price of bread, Parmentier began to promulgate the nutritional virtues of the potato and promote the tuber as the ideal alternative to grains. He invited Benjamin Franklin and other luminaries to lavish meals featuring potatoes prepared every which way: in stews, salads, pies and breads. He presented Louis XIV with a bouquet of starlike potato flowers; on a whim, the king slipped one through his buttonhole, inspiring a fad of potato flower accessorizing among the French royalty. Perhaps most cunningly, Parmentier arranged for soldiers to stand guard along a field of potatoes at the edge of Paris – so that the public would perceive the crop as valuable – but dismissed the soldiers at night, so people would have a chance to raid the field. Thanks in part to Parmentier, Europe learned to recognize the potato’s nutritional value and adopted it as a solution to widespread famine. Potatoes were easy to sow and harvest, as well as inherently more productive than grains: wheat, rice, corn and barley could only grow so tall and heavy before they fell over; nestled in the ground, tubers could swell to impressive sizes, yielding two to four times more calories per acre. A potato of average size contains 115 calories, 3.2 grams of protein, plenty of phosphorous and iron and half as much vitamin C as an orange. European ships brought potatoes to the East Coast of North America in 1621. Instead of allowing some potato plants to flower, cross-pollinate and produce seeds – each of which is a tiny packet of genetic diversity – America’s earliest potato breeders opted for the easier method of cloning, slicing off bits of tuber to plant in the ground. By 1850, America’s cloned spuds were feeble and riddled with virus-borne diseases. In response, breeders began to import potatoes from South America, creating new cultivars that not only were more resilient, but also had a variety of unique flavors, textures and shapes. Crack open a copy of M.M. Vilmorin-Andrieux’s 19th-century text The Vegetable Garden and you can sample some of this diversity, which is reminiscent of modern Peru: page after page of alien potatoes with canary yellow flesh and midnight blue skin; with casings “split like the skin of a truffle” or cratered with deeply sunken eyes; with names like snowflake, Manhattan, Early Rose, walnut-leaved kidney potato and red-skinned flour ball. During this time, a New York Episcopalian minister named Chauncey E. Goodrich – who grew potatoes as a hobby – ordered some from the American consulate in Panama, including a cultivar known as Rough Purple Chili: the progenitor of the Russet Burbank. In the early 1900s, the Russet Burbank was just one of thousands of different types of potatoes grown in the U.S. By the late 1980s this single variety made up the vast majority of U.S.-grown potatoes and is still the most familiar potato in the country today. Why? Well, it’s an all-purpose potato that holds up all right – though by no means ideally – whether baked, boiled, or mashed. But its most common and popular form is also the main reason for its rise to dominance: the McDonald’s French fry. In order to make those crisp golden fries, McDonald’s and other French fry producers need a very particular kind of potato. In order to make those crisp golden fries, McDonald’s and other French fry producers need a very particular kind of potato. It must be unusually long and smooth; pale and low in sugar, so that it does not brown when cooked; relatively dry; and hardy so it can be shipped great distances and stored for a long time. The Russet Burbank satisfied all these requirements better than any other variety: even after 12 months of storage, a Russet will yield plenty of gorgeous fries. Following World War II, new technologies greatly improved the efficiency of modern potato processing factories, which provide burger joints with frozen fries and also turn spuds into chips, hash browns, starch and flour. They, too, insisted on white potatoes uniform in shape and durable enough to travel from coast to coast; flavor, color, and diversity were not of great concern. In fact, varieties developed for potato chip companies (such as the Frito-Lay potato) are so high in starch and so low in sugar that they never appear in supermarkets; if cooked at home, they would taste awful. The demands of potato processors, and the apotheosis of the Russet Burbank, revolutionized not just the way Americans grow and eat potatoes, but also our entire concept of the vegetable. Breeders started to make many fresh-market potatoes more Russet-like and farmers started growing even more Russets than before; it was easier to farm a single highly lucrative variety for both processors and the fresh market than to bother with many different kinds of spuds for the produce aisle and all their different growing requirements. In 1960 the average American ate 81 pounds of fresh potatoes a year; by the 2000s, that number had nearly halved. In 2013, the U.S. harvested 43.5 billion pounds of potatoes. About 63 percent was used for processing of some kind. Only 24 percent went to the fresh market. The outcome is a kind of collective amnesia: we have forgotten what the potato can be – what it really is. What we need are a few modern-day Parmentiers, tireless champions of the lowly spud, to lead the potato renaissance. John Mishanec does not typically get his potatoes from the supermarket. A jovial man with a half laurel wreath of flossy white hair, Mishanec prefers to buy in bulk straight from the source – a 50-pound bag or two from his favorite farmers. At age 26, Mishanec began working for Cornell University as an integrated pest management specialist: someone who teaches farmers how to keep insects at bay while using as few toxic chemicals as possible. Over the past 40 years, he has trained dozens of onion, sweet corn and potato farmers throughout New York, with a special passion for the latter: “I definitely have a fondness, an affinity for potatoes. It goes a long way back.” When Mishanec was growing up in Olean, New York, his father taught himself how to be a potato breeder. Everyone in the neighborhood knew about the Mishanec’s bountiful potato patch and the odd collection of tubers and seeds in their attic. Jansky did not grow up dreaming about studying potatoes; her love for them flowered from an arranged marriage – this was the vegetable assigned to her when she began her professorship. “You work on something for 30 years and you develop a passion for it,” she says. “I’m convinced the potato is a good food, a healthy, nutritious, inexpensive food.” And a flavorful one. Jansky is determined to bring flavor to the forefront of her profession. She and her team have been rounding up cooks, farmers and members of the general public for a series of potato taste tests that examine acidity, sweetness, saltiness, bitterness, texture, off-flavors, and overall flavor intensity. Like Mishanec, they also routinely deliver spuds to a contingent of chefs for a hands-on culinary evaluation. Once they figure out which ones taste best – as well as how they stand up to pests and diseases – the team will cross-pollinate the most promising varieties to create a new generation of resilient and delicious spuds. Jansky is not content to codify subjective experience through taste tests, though. She wants to understand the empirical nitty gritty of potato taste, right down to the level of molecules. A few years ago, after collecting every relevant study she could find, Jansky published the definitive account of potato flavor chemistry. There’s not nearly as much data as she would like, but what she discovered is fascinating. Unlike fruits, which evolved to attract hungry animals that inadvertently help spread a plant’s seeds, wild potatoes were more interested in fending off nosy visitors. Any inherently appetizing flavors and aromas in wild tubers were an accident of chemistry, with which the ancient Andeans tinkered through millennia of breeding. Wild potatoes are often rife with toxic and bitter compounds known as glycoalkaloids, but in small enough doses they actually contribute to a pleasant taste. Cooking a potato completely changes its flavor chemistry, often in delicious ways. A cooked spud has some of the highest levels of umami compounds – molecules that stimulate a “pleasant savory taste” – of any plant food. At least 228 distinct aromatic molecules contribute to a cooked potato’s flavor, but most are poorly studied. To help fill in the gaps in the data, one of Jansky’s graduate students is currently creating detailed molecular flavor profiles of many different potatoes grown for the fresh market. She is also writing a grant proposal to identify the genes responsible for high and low starch levels. Similarly, Mishanec’s colleague Walter De Jong has pinpointed the genes responsible for red and purple skin and yellow flesh, as well as some of the genes that control whether these pigments saturate or merely speckle a spud. Potatoes sometimes get a bad rap nutrition-wise, but there’s nothing inherently unhealthy about a baked potato with a little salt; it’s the way we process and eat them that can clog arteries and pack on pounds. More flavorful and colorful potatoes will encourage healthier ways of enjoying them (in fact, it is antioxidants and vitamins that give potatoes their colors). Pinpointing color, flavor and texture genes will allow potato breeders to look for them in the DNA of potato seeds and young potato plants, which in turn helps them make smarter and more efficient crosses that enhance those traits – something breeders have already done for strawberries and tomatoes. This approach, known as marker-assisted selection, is an increasingly popular alternative to far more controversial genetic engineering. One of De Jong’s most recent creations, which came out of his studies on color, is Violeta: a spud whose yellow flesh and purple-stippled skin have caught the eye of famed New York chef Dan Barber. As tastemakers, chefs are powerful allies for breeders hoping to introduce new vegetables to the public. The Yukon Gold was first developed in Ontario in the 1960s, using yellow potatoes imported from Peru, and commercially released in the 1980s. It really took off in the 1990s, when restaurants in California recognized its appeal. To bring a whole new line of new potatoes out of the field and to the public, however, potato breeders will also have to convince large-scale growers and distributors that it’s worthwhile to experiment. There’s long been resistance to such innovation, but attitudes are starting to change. As tastemakers, chefs are powerful allies for breeders hoping to introduce new vegetables to the public. “I think diversification is starting to happen,” says John Norguard, an agronomist at Black Gold Farms, one of the country’s leading potato growers with operations in 11 states. “There is definitely more interest today than there was 5 or 10 years ago in different sizes and colors, gourmet and specialty varieties.” Sam’s Club, Walmart and few other stores have recently started offering Albert Bartlett Roosters – a nutty potato that starts pink and roasts golden brown – and Blonde Bellas, which have a “sweet, buttercream taste.” Wada Farms – another giant potato grower – has developed something not unlike the Quechua’s chajru: bags of bite-size multicolored round potatoes that can be cooked in their peels. At the end of October, I joined Jansky and her colleagues Julie Dawson and Ruth Genger at an agricultural research station in Wisconsin for one of their potato showcases. On an outdoor bench, beside rows of lettuces, herbs, and onions, Genger and her assistants arranged woven green baskets full of unusual potatoes. Barbara was a plump yellow spud graffitied with sprays of purple. When sliced open, Elmer’s Blue resembled a cross-section of an amethyst geode. In the left corner was a potato that looked nearly identical to one I had tried in Peru – the one that tasted like roasted chestnuts. To the right was a brand new cultivar with salmon skin and rosy interior: a cross between the red-skinned, white-fleshed Chieftain and Purple Majesty. Around me, farmers, gardeners, and locals oohed and ahed, snapping photos and gingerly touching the spuds, as though they were the fragile eggs of some exotic creature. It really was a marvelous spread: a tableau of everything we have forgotten about potatoes and everything that is on its way back.